We know not everyone is interested in showing or field trialing their dog and there is absolutely nothing wrong with just enjoying your Brittany as a pet. Some of our members are involved in Agility and Obedience events and really enjoy bonding with their Brittanys in this way. Of course, we also have several members who go hunting with their Brits!. 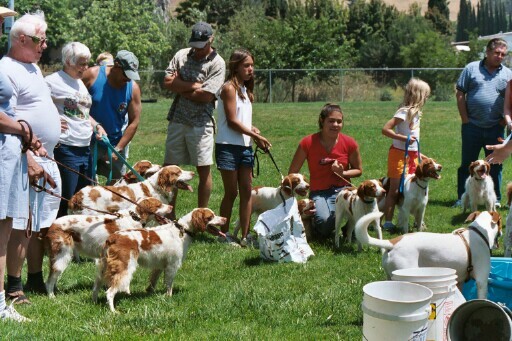 The club occasionally has training days for people and dogs that are interested in hunt tests and just plain ole hunting. "Rye" is shown on the right after pointing and retrieving his first pheasant! We usually have a picnic or potluck or two at some point during the year and we have a Christmas dinner during the holiday season to give everyone a chance to eat at least one meal without a dog begging nearby. A group of eager Brittanys (and a Pointer) await their turns at the "bobbing for hot dogs" contest during a club Fun Day at Poway Dog Park. 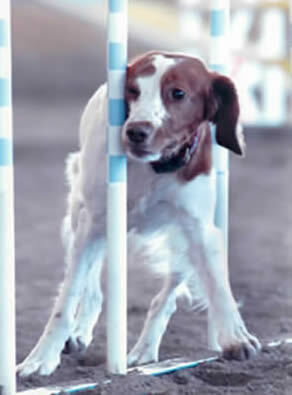 "Wally" takes the weave poles on the agililty course.